Queen Victoria may not be amused, but we’re certainly happy – it’s another keyhole mystery! This fantastic interactive resource is best viewed full screen on an interactive whiteboard. Children can move the keyhole around the scene to reveal different sections of the picture. 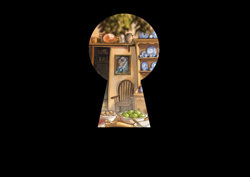 By examining what they see through the keyhole, children will build up a picture of the room and its owner, via the different objects and details. Also online is a black and white version of the illustration (see below). And don’t miss the traditional toyshop in next month’s issue! It is great to practice speaking.